TAG TEAM Pokémon-GX have introduced an exciting new element to the Pokémon TCG. These powerful pairs sport loads of HP and incredibly strong attacks. Not only that, each one also has a devastating GX attack that can become even more potent with extra Energy attached. Just make sure you protect these fearsome friends—if your opponent manages to Knock Out your TAG TEAM, they get to take three Prize cards! 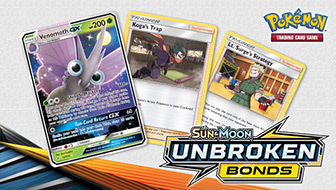 Here you can see some of the new TAG TEAM Pokémon-GX that you'll soon be able to find in the latest Pokémon TCG expansion, Sun & Moon—Unbroken Bonds. To gain a little more insight on the creation of these cards, we went straight to two members of the Pokémon TCG creation team. Here's what Atsushi Nagashima, game director of the Pokémon Trading Card Game, and illustrator Mitsuhiro Arita have to say about these TAG TEAM Pokémon-GX! Mr. Nagashima: When coming up with new TAG TEAM partners, we want to expand on the gameplay of the Pokémon TCG, so we think about which Pokémon could come together to have interesting attacks and gameplay gimmicks. This time, we wanted to pair two Ultra Beasts. Since there are a lot of cards that can power up Ultra Beasts, we felt that having a TAG TEAM Pokémon-GX card featuring Ultra Beasts could expand on the gameplay. Before settling on these two, we tried a few different Ultra Beast pairings by doing some rough illustrations. Maybe one day we will be able to show off those TAG TEAM pairs to you! How did you capture the distinct traits of these two Pokémon onto a single card? Mr. Arita: While there are exceptions, what I typically try to do when approaching a TAG TEAM Pokémon-GX illustration is imagine that the featured Pokémon are battling against foes. In this illustration, I had Pheromosa unleash a kick in unison with Buzzwole's punch to really emphasize the sense of speed and power of their attacks. By placing Pheromosa near the center of Buzzwole, I was able to really make its thin, white body stand out against the black-and-orange body of Buzzwole in the background. Mr. Nagashima: We chose these two Pokémon as a continuation of the more straightforward classic concept expressed by the Pikachu & Zekrom-GX pair. 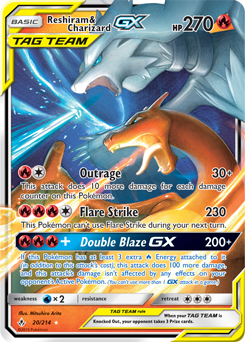 The background story to this card is that Charizard was completely surrounded by enemies, fighting against them all alone. Against insurmountable odds, Charizard fought bravely, and the Legendary Pokémon Reshiram, recognizing Charizard's strength, swoops in to the rescue. That's the scene that we came up with for this card. I feel like the coolness of Reshiram plays well off the more straightforward raw strength of Zekrom [in the earlier card] to create a very dramatic visual. Mr. Arita: By placing the two Pokémon in a collage style, I was able to create a very cool composition while also fulfilling the request I was given to make them feel like they are in the same space together. It's always a challenge with TAG TEAM Pokémon-GX cards, because the Pokémon must be drawn to scale in relation to each other, and there is a surprisingly big difference in the size of Reshiram and Charizard. I also need to make sure the illustrations work well as a card when lined up with the other cards in the set, from a perspective of visual balance and variety. These two Pokémon both have very large wings, but if I were to feature their wings prominently in the illustration, their heads would look very small, so finding the right balance is difficult. I tried to find another shared trait and settled on showing off their long mouths from a close-up side view. I think this worked well to convey the characteristics of these two Pokémon. In terms of coloring, I received an idea from the art director to show off Reshiram's blue flame, and I think that worked out wonderfully to create a nice illustration. I actually took another version of this to completion in which Reshiram's flame is also red. Mr. Nagashima: We really wanted to feature a duo of regional variant Pokémon in a TAG TEAM. By pairing two very similar Pokémon, it's easy to see how they are related, which fills your imagination with possibilities. To express the combination of two similar Pokémon, we designed the game data to be synergetic and increase their poison effect. As an aside, while designing the setting for this card, the staff imagined scenarios such as a “visual kei” rocker (a flamboyant Japanese musical style comparable to glam rock) and a hard rocker coming together to form a pair. Mr. Arita: I wanted to convey the story of how Muk turned into Alolan Muk by eating the garbage of the Alola region. 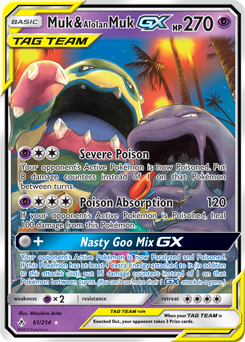 It's somewhat hidden behind the card text, but you can see that the garbage Muk is eating is quite colorful. As an aside, I first mistakenly received reference material for Grimer and ended up working up to the pencil sketch stage on an illustration for Grimer & Alolan Grimer. For the background, I wanted to convey the atmosphere of an Alolan city at night, with the palm tree leaves in the background illuminated by orange sodium-vapor lamps that also go well with the colors of the featured Pokémon. Mr. Nagashima: We wanted to do something a little different with this pair and go for a straightforward and intuitively strong TAG TEAM, reminiscent of pro wrestlers. Machamp has a Pokédex entry that says it can unleash 1,000 punches in just two seconds. That left a strong impression on me, so I knew I wanted to feature Machamp. I wanted to pair Machamp with another Pokémon that looks like it would be good at punching. I thought it would be fun to have the illustration show these two Pokémon both unleashing a storm of consecutive punches together. Marshadow has a Pokédex entry that describes it as craven and cowering, so I thought it would provide a good contrast to Machamp's almost foolishly upbeat and bright personality to really get people's imaginations going about what kind of situation might bring them together. Mr. Arita: The request I received was to show off both Pokémon unleashing a flurry of punches. 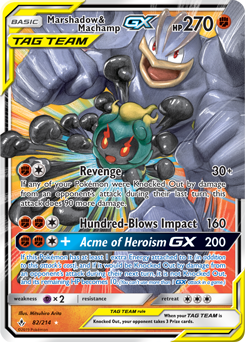 I also knew that there would be a lot of text on the card, so I put Marshadow right in front of Machamp and had the composition sort of looking down on the Pokémon so I could make sure they wouldn't be hidden behind the text. I kept the background simple and poppy so the manga-like furious fists visuals would stand out even more. In the areas covered by text, I employed a stronger use of color to make the illustration more visible. Mr. Nagashima: With Pikachu & Zekrom-GX really expressing a more traditional sense of strength, I wanted to try going for something more unorthodox or cunning in the next set. From there, we narrowed down the concept to Pokémon that dealt with illusions or were ninja-like, and we knew that these two Pokémon would go perfectly together. 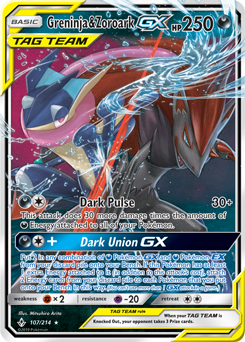 Their GX attack, Dark Union-GX, allows you to put two Darkness-type Pokémon-GX or Pokémon-EX from your discard pile onto your Bench. It's a unique move in that the opponent has no idea which Pokémon to expect, since even Evolution Pokémon can be put into play immediately. This card really came together from both a character personality perspective and an attack effect perspective to convey a sense of cunning and trickery. Mr. Arita: I tried to express the two coming together with a cooperative link attack by showing the moment that Greninja's Water Shuriken and Zoroark's Cut attacks would collide and combine into one. It was an attempt to convey the sense of time, which can be very difficult in a still image. Both of these Pokémon have tall proportions and are of a similar size, so it wasn't difficult to draw them together. I also drew some of the package art for the Japanese expansion, and on that I drew a very bright waterfall in the background, so it was a bit of a challenge to differentiate the card art from that look. 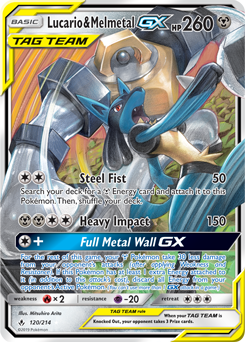 Mr. Nagashima: When I first heard about Melmetal, I knew I wanted to feature it on a TAG TEAM card. Since it's a Metal-type Pokémon, we initially felt it might be a good pair with another hefty Pokémon like Klinklang, but after some deliberation we concluded that a more agile and limber Pokémon would better show off Melmetal's cloddish appearance, and they would play off each other well when unleashing attacks. Mr. Arita: I was working on the initial rough drafts before the official reveal of Melmetal. Its face and eye are hard to recognize, so I wanted to make sure my illustration was easily identifiable as Melmetal. I first came up with the layout and decided to give Melmetal the best placement in the composition, which is the upper center of the frame, and depict the outline of its entire body including its left fist, head, and right fist. I really focused on making its silhouette recognizable even while parts of it are extending outside of the card frame. 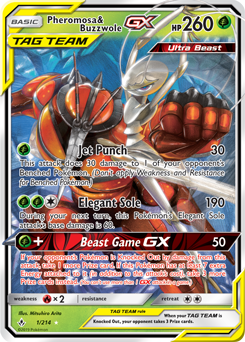 Mr. Nagashima: We thought about how to expand on what TAG TEAM Pokémon-GX cards could be, beyond just battle-focused or cool and strong-looking Pokémon. To this end, we came up with the idea of choosing a more cute and pretty pair of Pokémon for this card. 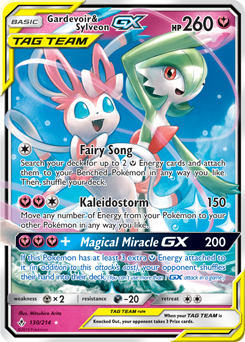 We came up with a few different options that might work as a dream team of “beauty” before we naturally settled on Gardevoir with its graceful appearance and the very cute Sylveon. We usually try to not go too far in the cute direction with Fairy-type Pokémon, but with this TAG TEAM, we knew we wanted to go all out with the cuteness. Gardevoir is winking in the illustration, but it was really challenging to make this look good and convey a sense of 3-D space. If I got it even slightly wrong, the sense of the characters being relaxed would not be conveyed, so I worked hard to get it just right. I also made a lot of tweaks and small changes when it came to which elements would protrude from “offscreen” into the illustration. Many thanks to Mr. Nagashima and Mr. Arita for sharing their insights into the development of these new TAG TEAM Pokémon-GX cards. 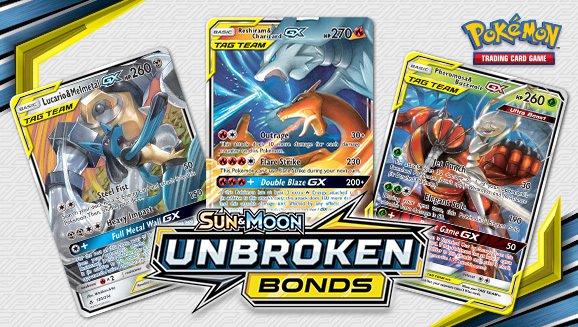 You'll be able to find these cards and more as part of the Pokémon TCG: Sun & Moon—Unbroken Bonds expansion, which will be available May 3, 2019, in the Pokémon Center and where Pokémon TCG products are sold.